We’re all busy blaming the internet and technology for our more sedentary lifestyle but how about turning the tables on that one and using it all to your advantage. 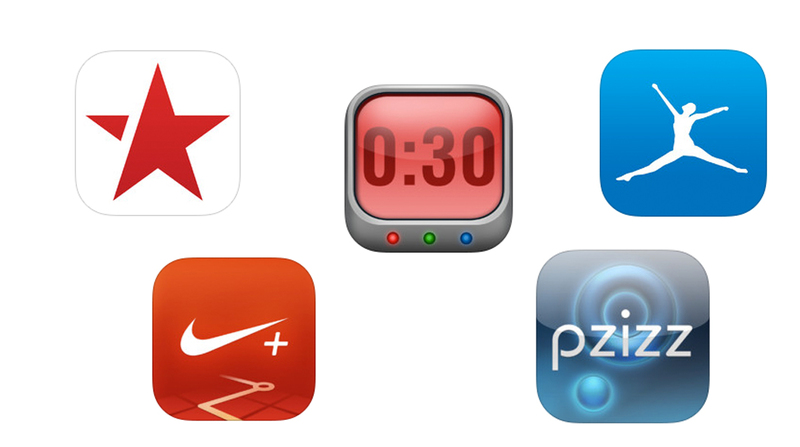 Most of us have a smart phone of one sort or another, so I present to you my five favourite apps that make being fit and healthy a breeze. My Fitness Pal: My all-time favourite and it’s free! If weight loss is your main aim, then knowing exactly what you eat is paramount – go see any trainer and the first thing they’ll tell you is to write down everything (and I mean EVERYTHING!) you eat. My Fitness Pal allows you to record whatever passes your lips, and gives you a breakdown of exactly how much fat, protein and carbs is in that tiny little slice of chocolate cake you thought you’d swipe when noone was looking. Now it’s set up with a barcode scanner, it makes it even easier to find your favourite foods, and I love that it’s completely set up for UK users – I’m so fed up with the food apps that only offer up list after list of American brands that aren’t available here. You can also record your exercise and activity level, be it cardio, resistance or cross fit and if you set up your profile on the computer, it’ll even calcualte how many calories burned. Such a good feeling. Trust me, it’s a great eye opener to your food intake, and somehow it pushes you to make healthy choices. Nike + Running: If you’re a runner, this is the one to go for. It’s by far the easiest of all the running apps to use; no faffing around when you want to get going, it just starts up, tracks your route by GPS, you can play your favourite playlist to keep you running when the burn starts to hit, it records your distance, your time and your speed. About the only thing is doesn’t do is make you a protein drink when you’re done! Oh, and if you’re the competitive sort, you can also challenge friends to a run and compare notes. And did I mention it’s free? Result! FitStar: if you’re soooo over gyms and want to workout at home, but wish you could have expert personalised training, take a look at this. Admittedly only for the iPad, it’s a customisable workout programme that changes with you as your strength and fitness levels improve. Hook it up to your TV and you can see your workout on the big screen. If you have to travel, take it with you and use it in your hotel room. Mainly a collection of body weight exercises, you don’t need weights – it’s the way forward, believe me! I’m not quite sure how this manages to be free (I’d definitely pay for this one! ), but I’m not arguing. Pzizz: If you’re increasing your activity levels (and possibly controlling your calorie intake) then you’ll need to make sure you get enough of one thing to make sure your body can still function. I’m talking shut-eye. Sleep-deprived people don’t workout as effectively and end up making stupid food decisions – at least, that’s my theory and I’m sticking to it! You may well find yourself falling asleep on the sofa by 9pm if you’ve just started working out, but if you have trouble geting to sleep, try Pzizz. Slightly different from all the other sleep apps out there, this one creates a different soundtrack every time – in theory this stops your brain becoming familiar with the sounds which would in turn, decrease the effectiveness. Using binaural sounds, it lulls you into a relaxing, restful sleep – utter bliss and worth swapping with a night out on the town any day! £3.99 (or £1.49 for the Lite Version). Previous Post Health & Fitness Week: A Bit On The Side….